Veterans are forced to wait 11 months or more for benefits they have earned due to a backlog at the Department of Veterans Affairs, the I-Team has learned. The backlog comes as more veterans are applying for benefits while the VA is transitioning from a primarily paper operation to an electronic system. Charles Mangarella Sr. was in the U.S. Navy, and battled in World War II. Today, at age 89, he lives in a nursing home and has Alzheimer's disease. For the last few years, he has been collecting a small Navy pension of about $90 a month – enough for the little things. “New clothing, the cost of haircuts each month,” said his son, Charles Mangarella Jr. Earlier this year, the small stipend was cut off. The VA said he was missing an annual income verification form. His son, who has power of attorney, would have to re-apply for his father’s benefits, a process he was told by the VA would take 11 months. The backlog may be best illustrated by the problems at a processing center in North Carolina. 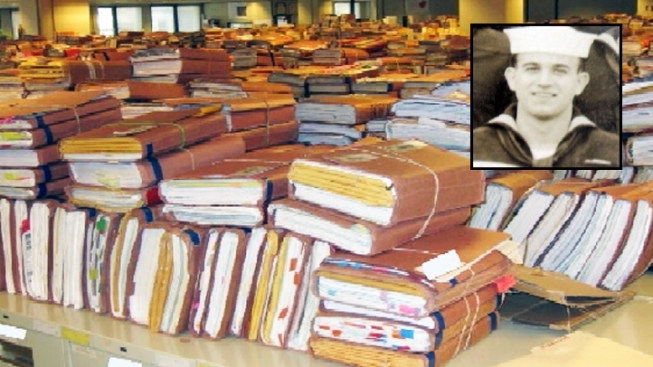 A recent Office of Inspector General’s report included photos showing about 37,000 claims folders piled, stacked and stored wherever workers could find space. Her advocacy group specifically helps veterans get the benefits they’ve earned. Murphy-Baker said an 11-month backlog is not unusual. “It’s a very paper-intensified system, so the examiner who is going through the claim has to go through the claim page by page by page and it takes a lot of time,” said Murphy-Baker. In a statement, VA spokesman Joshua Taylor said the agency's workload is greater than ever. Much of the backlog is fueled by returning Iraq and Afghanistan veterans who have been applying for benefits at much higher rates than veteran of previous wars. Data from the VA show claims have skyrocketed since 2001. The VA says its paperless system is being implemented in 18 regional offices this year and will be installed at all 56 offices by the end of next year. In 2015, the VA’s goal is to complete claims within 125 days. After the I-Team started asking questions about Mangarella, his benefits were re-instated. His son now worries for other veterans. “If they don’t have someone fighting for them, they’re lost. The system will eat them up,” said Mangarella.